Intensity Factor® (IF) and Training Stress Score® (TSS) are great tools for describing training loads for endurance workouts. However, all tools have their limitations. For TSS and IF, one of the limitations is accurately quantifying the training load associated with High-Intensity Interval Training (HIIT). Addressing this shortcoming is particularly crucial during lower volume, higher intensity training blocks, and for athletes who have real “top-end” power. Let’s briefly look at what you need to calculate the TSS of a workout. 1. Your Functional Threshold Power (FTP). Many view this as the maximal power you can hold for about one hour (we will get into the semantics on this later). 2. The Normalized Power® (NP®) of a workout. This value is a rolling weighted average power for the session, giving more “credit” for efforts above FTP. The idea of NP is to provide a better representation of the physiological cost of a workout beyond average power or total energy output. 3. Total Ride Time. The number of hours from start to finish of a session. First, you divide NP by FTP to calculate the Intensity Factor (IF). TSS = (IF)2 x Ride Time (hours) x 100. The problem with using TSS and IF for HIIT is as follows. Performance in HIIT depends on short duration power output (2). Short duration power output is not directly dependent on an athlete’s FTP. Therefore, using an FTP-dependent metric like TSS to describe a HIIT session inhibits the “relativity” TSS has between low intensity and high-intensity sessions. The critical point here is an athlete’s short duration power is not directly dependent on their FTP. Short Duration Power has greater dependence on a combination of training specificity and a rider’s genetic makeup. The most significant factors in very short duration power are glycolytic ability, neuromuscular coordination and muscle fiber type. To avoid a long-winded tangent, just know that athletes with more “fast twitch” muscle fibers (with the proper training) will be able to produce significant amounts of power for short durations relative to their FTP compared to “slow twitch” athletes (again, with appropriate training). To drive home the point that short duration power output is not directly dependent on FTP take a look at the graph below. This histogram plots the results from 6,000+ riders completing the same Power Profiling protocol. All short duration power values are set relative to FTP, so if rider A has an FTP of 100W and averaged 120W for five minutes, and Rider B has an FTP of 300W and averaged 360W for five minutes, both have a five-minute value of 120 percent (120/100=1.2, and 360/300=1.2). Immediately you can see that a rider’s power output over these short durations are not directly proportional to their FTP. 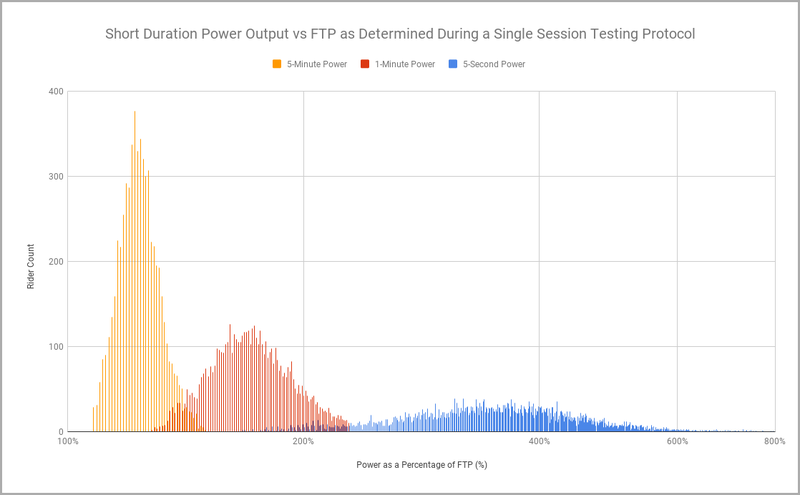 More significantly, there is overlap between the different durations, meaning that after completing identical testing protocols, one rider’s five-second power relative to FTP is equal to or less than another riders one-minute power, relative to FTP. 1. Since short duration power and FTP are not directly dependent on one another, you should not use your FTP to set power targets for high-intensity intervals. 2. You need to know “who” you are as an athlete. Knowing how your short duration power relates to your FTP is critical to properly interpreting your TSS value from any given workout. Currently there are a handful of programs/apps that can be used to address these issues, but for now, we will focus on WKO4 and The Sufferfest Training System (specifically their use of “4-Dimensional Power, or “4DP”). Both offer greater insight into a rider’s fitness/ability beyond “what is your FTP,” and both aim to give individually tailored interval targets based on your relative abilities across different durations of efforts. However, they use different approaches to solve the same basic issues. Let’s start by looking at the development of both. WKO4: Developed by Dr Andrew Coggan, Hunter Allen and the WKO Team, pioneers who helped turn the power meter into the most useful training tool in cycling, and who literally wrote the book on Training and Racing with a Power Meter. The Sufferfest “4DP”: Developed by Neal Henderson, former Director of Sports Science at the Boulder Center for Sports Medicine, recipient of the Doc Counsilman Coach of the Year award by the United States Olympic Committee (among others). One of the most significant differences between these two programs is how they determine a rider’s power metrics. WKO4 uses a “Power Duration Model” or PDM. The PDM takes all of a rider’s data from the previous 90 days, selects the peak powers across all durations ridden in those 90 days, and applies a series of formulas that give the user several metrics. These metrics include, Pmax (peak power output), Functional Reserve Capacity or “FRC” (total work that can be done above FTP during continuous exercise), mFTP (modeled FTP based on the power Duration Model) and Time To Exhaustion or “TTE” (duration that a rider can maintain their mFTP). If you would like more precise definitions, testing protocols, or want to brush up on the other metrics, you can do so here and here. The Sufferfest 4DP model uses a testing protocol called “Full Frontal.” The one-hour testing protocol contains five maximal efforts of different durations: two seven-second sprints, a five-minute effort, a 20-minute effort and finally a one-minute effort, completed in that order. 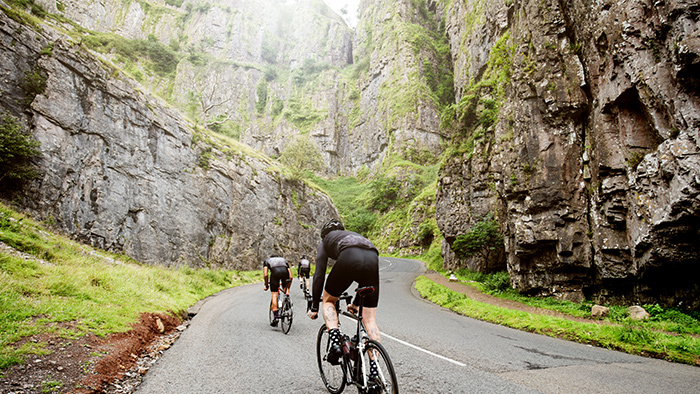 The order of the test and the specific recovery duration between each effort is critical to accurately interpret a rider’s results as each effort has a specific “downstream” impact on the efforts that follow. Each duration of effort represents a specific metric, which are: Neuromuscular Power or “NM” (five-second peak power indicating instantaneous power production), Maximal Aerobic Power or “MAP” (five-minute peak power, representing power production at VO2 Max), FTP (20-minute peak power, highest steady state power a rider can hold) and Anaerobic Capacity or “AC” (one-minute peak power, combination of a riders anaerobic ability and their ability to recover). Arguably the most useful feature of each platform is the individualized/customized power targets that use metrics beyond FTP. Instead of the FTP based power zones, WKO4 gives users “iLevels” which have both specific power ranges and time durations for each power level. They further improve on this with “Optimized Intervals” which suggest specific iLevels to target, along with ideal interval length, number of repetitions, and recovery duration between reps.These Optimized Intervals make creating your own specific interval workouts easier than ever. The one potential limitation is that these targets are based on your 90-day PDM, which means if you haven’t done intervals of a specific intensity/duration in the last 90 days, then the power targets of durations for the corresponding iLevels could be off. The Sufferfest Platform contains a wide range of workouts with corresponding videos and music to ensure you get the maximum training benefit from the turbo, without boring yourself to sleep. Time spent on the turbo is both entertaining and will still be a great workout. When using 4DP, The Sufferfest app will set power targets for all intervals based upon the most relevant metric for the type of effort. This means recovery efforts are still set as a percentage of FTP, but shorter, higher intensity intervals will be set relative to MAP, AC, or NM power, depending on the effort. The interval targets will now be closer to that rider’s true capacity for that effort duration. The limitation you run into here comes down to targets that are based on Power Testing results. Meaning if your fitness is changing rapidly, repeated or frequent testing is required. Each metric can be manually altered, but is not recommended. Knowing that HIIT requires maximal or near-maximal efforts, providing individually tailored interval targets removes the “pacing guesswork” involved in these near maximal efforts. Both platforms improve your chance of “nailing” a workout, as your targets are less likely to be too high, causing you to blow up, or too low, which won’t produce the intended training stimulus. The Sufferfest rider types are not based on absolute power values (or even watts/kg), but rather on the relationship between the Full Frontal test values relationship to one another. Individuals with above average short duration power (as seen by riders with high Pmax:FTP, FRC:FTP, NM:FTP and AC:FTP ratios) are classified as “Sprinter” or “Pursuiter” in WKO4, and as “Sprinter” or “Attacker” by The Sufferfest. These are the riders who should use the greatest caution when mixing TSS and HIIT. To illustrate this, let’s look at two hypothetical athletes. Both have the same FTP, but Rider A has a greater Pmax and FRC or NM and AC than Rider B. If we give both riders the same high-intensity interval session consisting of 10 x one-minute maximal efforts, Rider A (with the superior short duration power) will average more power during each of the one-minute maximal efforts. That will result in Rider A having a higher Normalized Power (NP) for the session (assuming recovery intensity between intervals is the same). Since NP is used to calculate both IF and TSS, they will also be higher for Rider A. Based solely on the IF and TSS for the session, you would conclude that Rider A experienced a greater training load than Rider B, despite the fact that Rider B also completed the one-minute efforts at their maximal output. Did Rider B have an “easier” session? IF and TSS would tell you yes. According to Rider B and his/her capabilities, no. You can argue that Rider A used more total energy during this session, which would make it harder, but that argument directly contradicts the rationale behind using TSS in the first place. TSS is intended to dispense with “absolute” measurements like Kj burned or total miles ridden, neither of which give an accurate picture of how hard a training session was relative to that rider’s individual abilities. To tackle this idea from a different direction, let’s take these same two riders but change the workout slightly for only Rider A. Rider B completes the same session, but now Rider A is asked to hit the same power targets that rider B held. Remember, Rider A can produce higher power for short durations, meaning these new targets are below Rider A’s maximal ability. This time both riders end with the same NP/IF and TSS. Now based on IF and TSS you would conclude that both experienced the same training load. However, we know that Rider B was riding at their absolute limit during the efforts, while Rider A was riding at a level well below what they were capable of. Same IF and TSS, but substantially different training doses. Does this mean that TSS should be ignored by certain rider types or for specific workouts? Absolutely not. However, you do need to look at both rider type, and workout type when evaluating the TSS from any given session. Regardless of rider type, for lower intensity sessions TSS is still the gold standard. For HIIT sessions, riders with above average and below average short duration power will respectively see inflated and underestimated TSS values. The intended training dose of a HIIT session is what matters, not the exact TSS. As individualized power targets become more accurate and more accessible, the same individualized approach needs to be applied when viewing IF and TSS. These metrics are fantastic tools and will continue to be fantastic tools, but you have to understand the limitations of a tool if you want to unlock its full potential. Download a free 14-day trial of WKO4 and join the WKO4 Facebook Group. For more information on 4DP visit The Sufferfest. Mac has been coached by Neal Henderson (Founder of APEX Coaching & Consulting) since 2009 and began working at APEX in 2015 after becoming a level 2 USAC certified coach. Having spent time racing internationally on the road and track while earning a degree in Integrative Physiology from CU Boulder, Mac understands the difficulties of balancing high-quality training with other full-time commitments. After focusing mainly on the road for his racing career Mac has now shifted his focus to track racing and is the current US National Champion in the Points race. His main goal is to qualify for the 2020 Tokyo Olympics in the Team Pursuit.